I have always wanted tattoos and have always had a lot of ideas, but somehow I didn’t get one. When I applied to the airline I work for now, I was glad about that, because a lot of airlines aren’t exactly looking for staff with forearm tattoos. However, once you’re in, the only rule is that no tattoos are visible at work. As I’m often cold, I wear long sleeves anyway, so now there was nothing holding me back. When my pretty tattooed colleague Jessie made an appointment with her tattoo guy on Hollywood Boulevard for our L.A. layover, I tagged along and got a bow with a pearl necklace on my arm. Did that hurt? Um, yes. Especially on my elbow. I must have pulled some funny faces, because at some point I seemed to be entertaining several random people that had walked in and stayed. I asked them for admission, thinking, that might pay for the whole tattoo, but they vanished. Okay. When we were finally done, we bought a bag of chips that we ate sitting in the car back to our hotel with our freshly wrapped tattoos. Half the night I spent staring at my swollen arm that I had put on a pillow and thought, what have I done …? We flew back the next day. First my boss slapped me on the arm to praise me for something and I almost jumped to the ceiling. Did you get an electric shock, she asked. I nodded, not into the idea of telling her about the brand new tattoo. The passenger who got afraid when it got a little turbulent and dug her nails into my arm finally convinced me to get my next tattoo at home when I have a couple of days off and people leave my arm alone. But that there was going to be a next tattoo I knew right away. Meanwhile I have three on my arms and my back suddenly looked so empty. I have thought about what to put there for several years now and had a couple of ideas, but none of it convinced me enough to actually get an appointment. 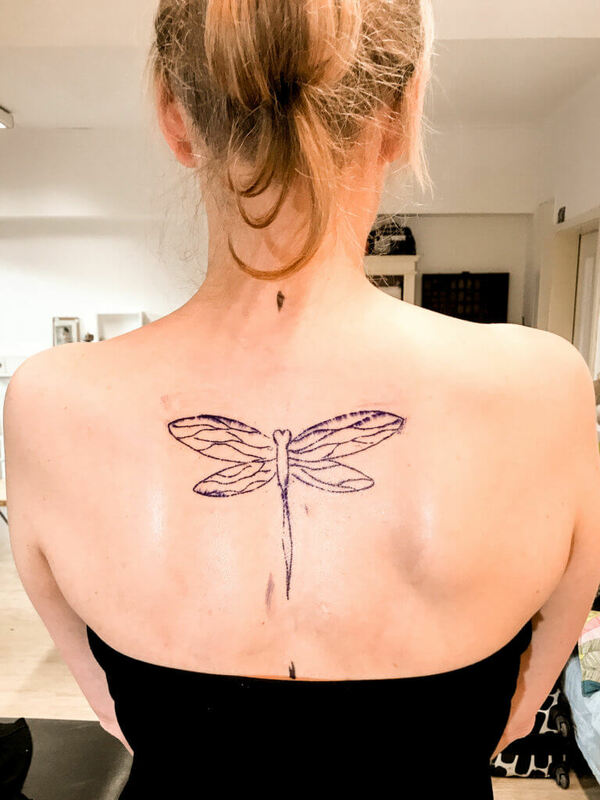 Until I thought: dragonfly! I suddenly noticed that everywhere in my apartment I had accumulated dragonfly designs. 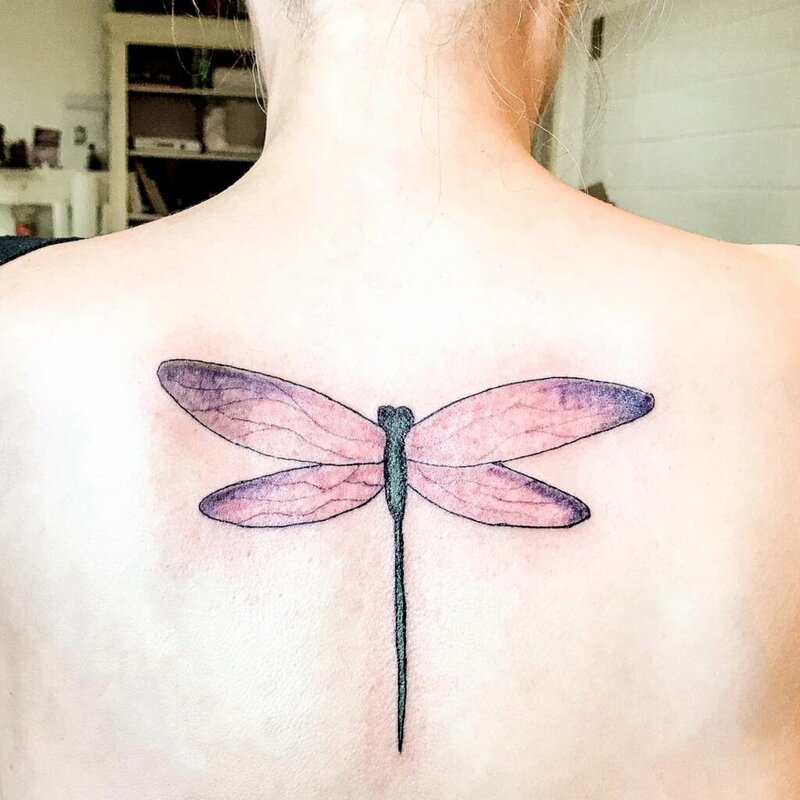 The dragonfly represents metamorphosis and freedom, which must have attracted me for quite a while. 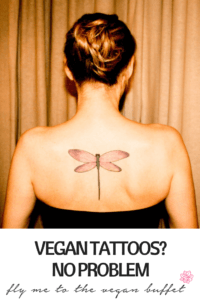 Now I didn’t want to be all paranoid at the studio about the colours or products being vegan or not, but rather have a vegan tattoo artist where these things are not an issue. There are quite a few and you can find them on vegantattoostudios.com, where you can filter for locations. If you enter Berlin, you will also find Panke Nicolat, whom I’ve known for a couple of years from punk shows and whose work I like very much. He is originally from Mexico, and the typical Mexican style – bright colours, flowers and skulls – is very present in this work. I wasn’t sure what a Mexican dragonfly would look like, but it just felt right. 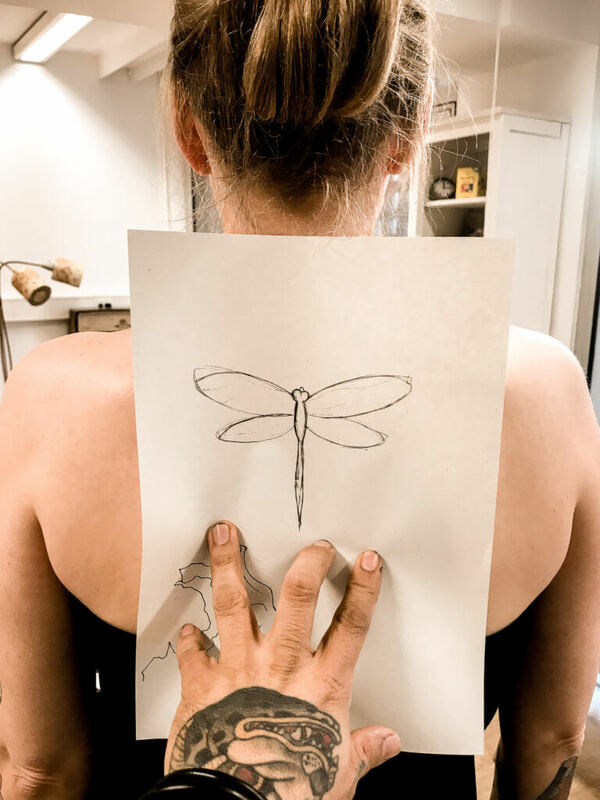 We met a couple of weeks before the appointment for a vegan snack and looked at pictures of dragonfly tattoos, talked about what we think looks good and what doesn’t. Everyone has their own way of getting tattoos. Some people draw a picture and want it exactly like that, others have no idea and just let the artist come up with something. I usually have a vision of what I want, but can’t draw very well. That’s why I need someone who just gets me and whose ideas make the best out of my vision. My tattoos always look a little different than I thought they would. And much better. Just like this time. Australia built a quite stylish embassy in East Berlin back then, and meanwhile a lot of artists moved in. Panke’s studio, where I had my appointment, is in there too. First I looked at the design and placement. I liked the dragonfly a lot, but wanted it a little lower. Exactly. And maybe a little wider? This is what it looked like after it was done. I found it less painful than I had expected, the elbows were way worse back then. What I like most is the shimmering colour of the dragonfly’s body. It was wrapped up for the way home. 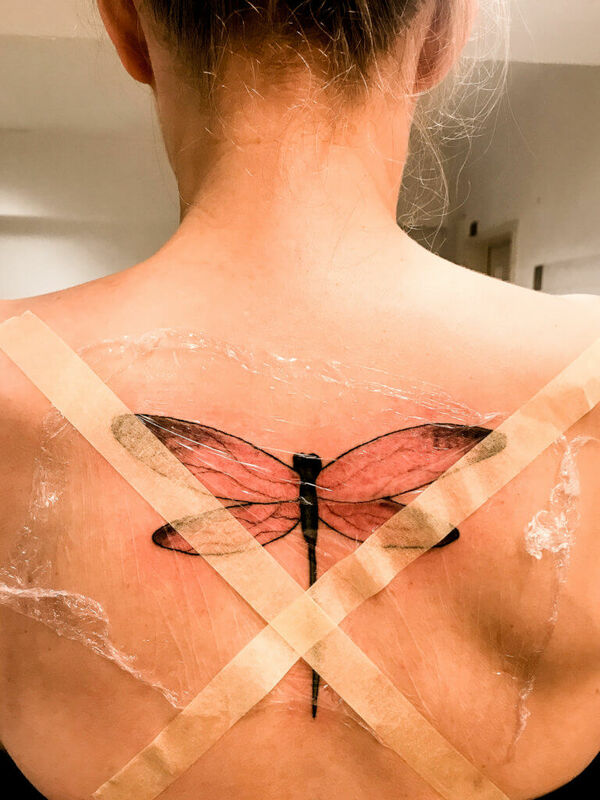 Before going to bed I removed the cling wrap, rinsed the tattoo with hot water and applied tattoo aftercare. There are a lot of vegan products on the market and I decided to get the Tatau-Butter by Natural Organics. It is easy to apply, has a nice lemony scent and moisturises for many hours. It contains shea butter and jojoba oil and is supposed to heal the skin up to 50 % faster. I can’t tell if that was really the case, it’s been to long since I last got tattooed, but it did heal fast. The first two nights I was careful not to lie on my back, but then I completely forgot about it. I think I can go back to yoga now. Do you like this post? You can pin it on pinterest by clicking on the red button below.